When it comes time for an owner to sell his or her house or place of business, he or she must determine the value of the property. Part of the appraisal process includes a series of inspections of the different parts of the building’s infrastructure, and the plumbing system is one of the parts that is examined. A proper inspection will determine how well the current plumbing system is working, which parts need to be serviced or replaced, and how long those parts will endure before the system has a critical failure. Most sellers are merely trying to assess the value of their home or office. They are ready to move on to a new property, and focus their attention elsewhere. But this inspection is still important, because it gives the owners feedback on how well they have been maintaining their property, and also how much it will cost them to prepare it for sale. A good inspector will help an appraiser understand exactly how much a good plumbing system is worth to the property. He will also help the owner to make a decision on whether or not it is worth the investment to make critical repairs; in some cases, a seller may simply want to sell the building as is, and pass the burden of any needed repairs on to the buyer. On the other hand, the buyers want to know exactly what they are getting into. Nobody wants to buy a money pit, and a faulty plumbing system is something that a buyer would prefer to avoid. Regardless of what other problems a building may have, cosmetic or otherwise, if a home or office has a reliable plumbing system, the owners have one big problem off of their minds. If the home or office needs work, the owners can invest their own sweat equity into molding the property the way they want, without having to devote time to a critical area that is really better left to a professional. Knights Plumbing has been performing video inspections of homes and businesses to facilitate real estate transactions for many years. Over that time, we have continued to upgrade our equipment, and now we use the very best sewer and drain cameras on the market. Our plumbing technicians are certified and trained to use them by the manufacturer, and you can bet that we will provide for you the very best information and imaging that can be found in the plumbing video inspection industry. Our cameras take photos of the inside of your pipes and drains, and capture video footage as well. We convert this data into files that you can use at your convenience, and these files will help you and the appraiser to come to an agreement. The importance of such data in a real estate transaction cannot be understated; neither side can accuse the other of being dishonest when the data is right in front of both parties on the video monitor. Knights Plumbing will identify every flaw in the network, and back it up with hard evidence. Knights Plumbing have become experts at reading video footage. Our high resolution cameras only make the job easier for us. On our monitors, we can spot cracks, roots, collapsed or broken pipes, and even pinhole leaks. If dirt, rocks, or debris are clogging the pipes, then we will see it and tell you how they can be removed. If the pipes are corroded or damaged, we will tell you that they need to be replaced. And if there are ways of avoiding costly plumbing expenses, such by using Cured In Place Piping (CIPP), then we will know about it, and recommend a solution that is most cost effective. Knights Plumbing Can Find the Problem – And Fix It! 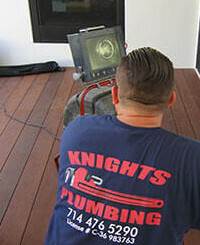 The best reason to hire Knights Plumbing to perform the video inspection of a building to be sold is that we can fix any problems that we find. Unless the property in question has a massive breach that requires digging (which is rare), Knights Plumbing will likely be able to perform all of the needed repairs the same day that we perform the inspection. Our diagnostic video inspection is the same inspection that we perform when tackling any routine plumbing emergency. So when we perform your real estate inspection, we’re already off to a great start in fixing the problem. Because Knights Plumbing already knows exactly what the problem is, we can immediately quote you a fixed rate to perform the repairs. We will show you the problem on the monitor, and you can approve the work right then and there. If you are the buyer, you can deal with the problem immediately, and know that it won’t cause any setbacks in the sale of your property. After we perform the needed repairs, we will simply re-do the inspection, and give the property a passing grade. We will fill out all of the paperwork you need, and upload it and send it to the realtor, and to whomever else needs to see it. If we perform the inspection during business hours (which is normal), we can actually get approval from the seller right then to make the necessary repairs, and then the problem is ancient history for buyer and seller. 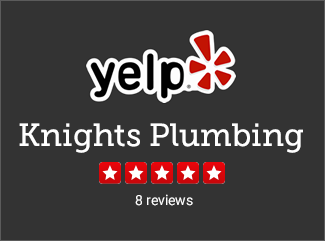 Knights Plumbing is a full-service plumbing company, and we will have the equipment on hand to tackle most any plumbing challenge, and deal with it quickly. This is a satisfying part of our job, because we know that both parties are at peace because the work has been finished, and the transaction can go forward. Knights Plumbing offers flat rate pricing on all home inspections. We are available any day, any time. Located in the heart of Orange County, we can be available at any time to handle any plumbing emergency you may experience. Our plumbing professionals will arrive promptly, clean and well-groomed, and we will give you the respect and consideration that you deserve. We have built our reputation on providing the very best customer service in Orange County, and that’s exactly what we intend to provide for you.